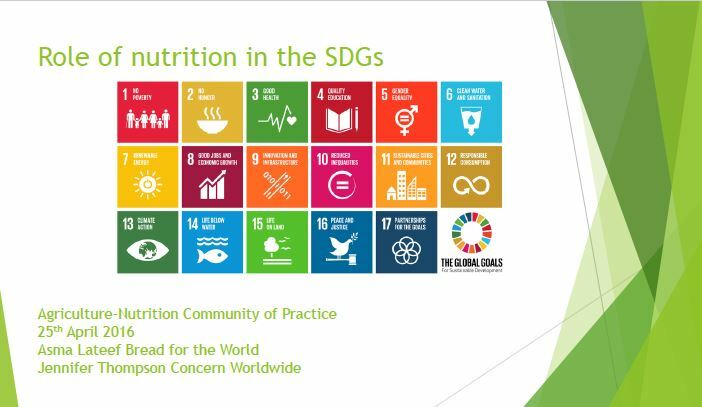 In the April call of the Ag2Nut Community of Practice, participants discussed the role of nutrition in the Sustainable Development Goals (SDGs). Participants heard from from Asma Lateef, Director of Bread for the World Institute and Jennifer Thompson of Concern Worldwide, as well as Edye Kuyper of UC Davis. They discussed the current place of nutrition in the SDGs, agriculture-nutrition opportunities and the process and lessons learned by nutrition advocates during the SDG decision-making process.